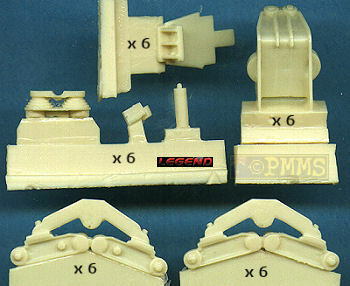 As we know one of the major issues with the recent Academy M3 Lee (kit #13206) was the suspension bogies which are too tall when compared to the actual bogie dimensions. Three resin update sets have been released to correct this if you don’t wish to tackle the job yourself as demonstrated in the Steve Zaloga article in Military Modelling magazine. This comparison will just address the basic suspension updates sets and the others will be reviewed separately at a later time. Unfortunately I have not been able to get hold of the ABM set despite lodging an order direct with ABM some time ago so this comparison will initially deal with the Formations and Legends basic suspension sets and hopefully will be updated if I can get hold of the ABM set. Both the sets utilise parts from the Academy kit such as the road wheels and return roller with the Legends set and the suspension arms with the Formations set. 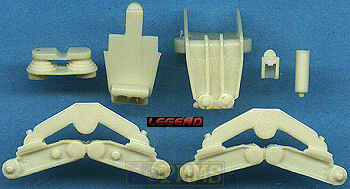 This consists of just 4 parts in light cream resin with the main bogie unit cast in one piece with separate volute springs and return roller plus a length of plastic rod. The usual casting blocks are to be removed but as the bogie unit is cast in a single quite complex casting it results in additional cleanup of some “furry” edges around the inside of the bogie unit but nothing too dramatic. Dimensionally the bogie unit is still just over 0.5mm too tall when compared to the actual bogie measurements but correct in depth and also includes the correct cut-outs in the upper bogie flange with the assembly using the Academy kit suspension arms and wheels very straightforward. The return roller simply fits in place and the volute springs attached with the Academy kit suspension arms and road wheels held in place with the plastic rod supplied, all very easy. The only problem being the plastic rod supplied is too thin and I used a length of 2mm plastic rod for a more precise fit. There is also a small bolted plate to fill the bogie locating recess on the underside of the Academy hull left open when adding the Formations bogie which fit easily to the kit hull bogie mounting plates. This is made up of 7 parts in light cream resin with again just the casting blocks to be removed but there are some issues with the dimensions and assembly. The height has been reduced but is actually now about 1mm too short when compared to the actual bogie measurements and also in the process the depth of the bogie is now 1.5mm too shallow and the suspension arms lack details such as the two small rivets under the upper arm junction and the axle hubs are the wrong profile. to the Academy and Formations bogies with the correct depth. The suspension arms are designed to just sit in the kit wheel axle hole as there is no actual axle provided but the shallow bogies show themselves again as the central lugs between the inner and outer suspension arms are too short and just don’t meet up leaving a large gap. The suspension arms are designed to be glued in place inside the bogie unit as there is no locating pin and you have to be careful to glue them at the correct height or the overall bogies will not be tall enough. The return roller mounting is in two parts and quite fiddly to assemble as there is a small pin on one end of the roller axle but no corresponding locating hole in the mounting posts which you will have to drill. The roller mounting post is also too short meaning the roller does not sit at the right angle if used as is and there is also a fit problem with the Academy return roller due the depth issue with the bogie. 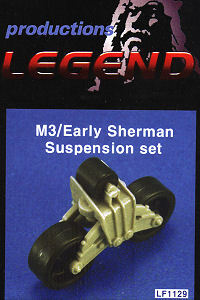 Unfortunately given all these issues there is simply not a lot to recommend for this set with the suspension arms lacking detail and the bogie units being 1.5mm too shallow as well as tricky assembly, even using the Academy kit suspension arms you still have the depth issue to contend with. 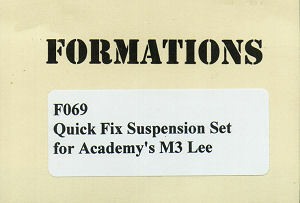 Out of these two sets the Formations set is clearly the better choice for a quick fix despite the bogies being still slightly too tall but a lot less than the Academy bogies and by using the more detailed set #F070 M3 Style Suspension will improve the Academy kit suspension that much more. Hopefully if I can get hold of the ABM set I will update this comparison further.